ATF Headline Gothic cries out to be used in headlines, and that is exactly how it was used after it was first created by American Type Founders in 1936 with newspapers in mind. It would be hard to imagine a better typeface for a shocking front-page headline in a scene from an old black-and-white movie. With its all-caps character set and its big, bold, condensed design, ATF Headline Gothic is the epitome of its name. Extra! Extra! The style of ATF Headline Gothic recalls the bold, condensed gothic display faces of the 19th century, but with more refinement in its details than many large types of the time (typically wood type). Its most recognizable trait is the restrained high-waisted M, with short diagonal strokes that end with their point well above the baseline; this avoids the sometimes cramped look of a bold condensed M with a deep “V” in the middle, common in many similar headline faces. 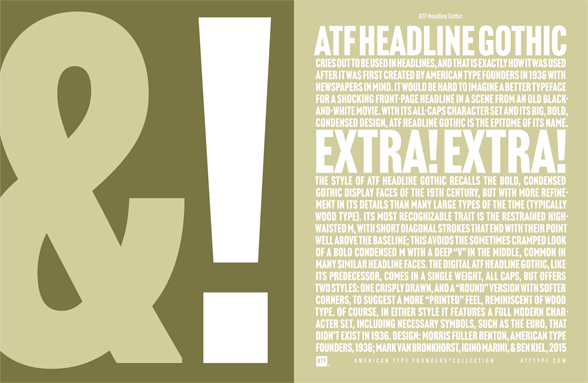 The digital ATF Headline Gothic, like its predecessor, comes in a single weight, all caps, but offers two styles: one crisply drawn, and a “Round” version with softer corners, to suggest a more “printed” feel, reminiscent of wood type. Of course, in either style it features a full modern character set, including necessary symbols, such as the Euro, that didn’t exist in 1936.